As prime contractor for this project, Lyles Utility Construction installed over 6,100 LF of 8” polyethylene gas piping and constructed an in-line pressure regulating station to increase both the pressure and volume of natural gas in The Southern California Gas Company’s existing distribution system. These pipeline pressure and volume upgrades were necessary in order to provide gas service to a new high volume food processing client. Due to high traffic in the area, a horizontal directional boring unit was utilized to install the pipeline, limiting the impact of construction on the surrounding community. In addition to the new service installed, we tied-over six existing services from the existing pipeline to our new pipeline and completed three complete service replacements. All piping was strength tested to confirm its safety, and ensure that it is in accordance with The Gas Company’s Standard Practices. On this project, Lyles Utility Construction installed a steel natural gas pipeline for Southern California Gas Co. that increases both pipeline pressure and volume in order to provide service to a new high demand customer. Lyles Utility was responsible for welding and coating approximately 7,500 LF of 6” steel piping, and assisted SoCal Gas with the tie-in. The pipeline was installed in a high traffic area utilizing a horizontal directional boring unit to limit the impact of construction on the community. In addition to the pipeline, a new 6” metering station was fabricated and installed in order to serve this new customer with gas. The pipeline was strength tested with nitrogen to guarantee safety in accordance with the SoCal Standard Practices. Lyles Utility Construction served as the prime contractor on this Pipeline Safety Enhancement Plan (PSEP) project for Southern California Gas Co. performing all work related to excavation, fabrication, removal, installation, and hydrotesting of a 30” diameter steel repair segment. Due to the nature of this pipeline, all work was performed while the pipeline was live, thus requiring the use of fire control during welding operations. This repair segment was critical for the transmission of natural gas to over 20 communities within the LA Basin representing thousands of homes and businesses. The 20 hour tie-in on this 600 PSI pipeline was completed safely, without interruption or incident, to the satisfaction of our client. This project was constructed as a part of the general So Cal Gas Pipeline Integrity Program to provide vital pipeline testing and inspection infrastructure. Lyles Utility Construction provided all manpower and equipment on this project and provided all manpower and equipment to fabricate, install and test high pressure “smart pig” facilities at two locations along existing Line 8109. Under this contract, Lyles Utility Construction constructed a 20” launching facility at the Cuyama Station and a 20” receiving station at the Apache Valve Station located 18 miles to the southwest. This design-build project was performed under a “PG&E Applicant Install” agreement which allowed for significant cost savings and schedule acceleration over the traditional “PG&E Utility Install” method. Lyles Utility Construction was the prime contractor and worked closely with the owner, our engineering partner, PG&E and the various public agencies and landowners during the design, permitting and construction of the project. This was a shared project between two owners, Gallo Cattle Co. and Foster Farms, and allowed them to convert the fuel supply at their processing plants from private propane systems to PG&E natural gas. To make the conversion, Lyles Utility Construction installed 39,000LF of 8” HDPE transmission gas pipeline. Upon completion, the facility was dedicated to PG&E who will own and operate the pipeline within their utility infrastructure. Project: Convert pump drivers from electric motors to natural gas fueled engines. End Result: Owner captured significant operational savings from this conversion. Lyles Utility Construction was the prime contractor on this design-build project in Southern California that allowed for the conversion of the pump drivers on the existing onsite Bonanza Ranch water production wells from electric motors to natural gas fueled engines with angle gear drives. Lyles Utility Construction worked closely with the Owner, our engineering partner and the Owner’s engine manufacturer during the design and construction of the gas pipeline conversion project. Lyles Utility Construction installed 77,000LF of 2”, 4” and 6” HDPE distribution pipelines and 25 each 1 1/2” HDPE service pipelines. 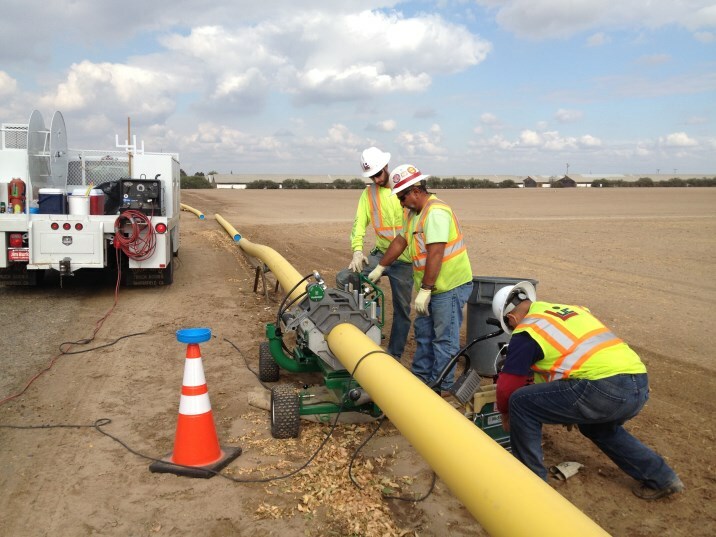 Upon completion of the gas pipeline conversion project, gas was delivered via a metered service provided by Southern California Gas Co. and the Owner captured significant operational savings.